Sue was excellent and made our tour memorable! Highly recommend this tour of Bath. Sue was knowledgeable, fun, and thoroughly enjoyable! Thank you Sue. TOUR GUIDE RESPONSE: Thanks for your rating. It was great to meet you all and find we had so much in common too. Hope you enjoyed the rest of your time in Bath. Our Jane Austen tour of Bath with guide Susan last week was all that we hoped for and more. We were shown the highlights of Jane Austen's stay in Bath and thus we got to know more about her plus seeing the beautiful attractions of Bath! Sue herself was highly knowledgeable and very amiable and we got on very well with her. We'd recommend this tour and Sue herself to anyone interested in Jane Austen and Bath itself! Sue is interesting and knowledgable about Bath. TOUR GUIDE RESPONSE: Thanks for the good feedback, Hendra. I enjoyed my tour with you. TOUR GUIDE RESPONSE: It was lovely to meet you all and thank you so much for the review. Susan was a delight, well informed and reliable as to information, meeting instructions, and itinerary. Long story short, you need her as your guide. TOUR GUIDE RESPONSE: Thanks very much for the great review. Have been using Tours By Locals for several years on our travels and this one lived up to their high standards. Despite a gloomy day in Bath Sue made this an enjoyable and interesting tour. TOUR GUIDE RESPONSE: It was great to show you round Bath and thank you for your review. I signed up for the tour of Jane Austen's Bath to learn more about Jane Austen's life in Bath. I was very impressed with Sue's prompt email replies when I arranged my tour. She was also accommodating to our needs, and she even agreed to meet us at our apartment. Sue was delightful in person, and we learned a lot from her. I highly recommend this tour to anyone visiting Bath. Thanks, Sue. TOUR GUIDE RESPONSE: I am delighted my tour helped you with your research into the period Jane Austen lived in. Thanks for recommending me. The Best Jane Austen Tour Guide! My daughters and I are unembarrassed Jane Austen fans and our cup was full by the end of the tour. We walked, saw and experienced things I did not see in a previous guided tour of Bath. She also showed us other things not related to Austen and was very informative and approachable. Excellent guide! TOUR GUIDE RESPONSE: It was great that we were able to change the City and Country walk into a Jane Austen in Bath/City Highlights walk and you are all so knowledgeable about the books! I am so pleased to hear that you enjoyed our time together. For me this packed half day with Sue was very special as it combined places associated with my own family history as well as some of the sites for which Bath is famous and their historical significance. Sue thoughtfully built in some rest stops and adjusted the pace to my plus seventy five years. She also made suggestions of other places I personally might find interesting. Her enthusiasm and love for this lovely old city is evident in everything she pointed out or explained. TOUR GUIDE RESPONSE: Thank you Mary. I thoroughly enjoyed our special afternoon looking at the places where your family had lived and thinking about the sort of lives they may have had. They certainly had good views. Good luck with the project. Susan was a great guide, she made Jane Austen's life and literary works come to life as we visited the places where Jane and her characters spent their days in Bath. We had an enjoyable morning with Susan. I highly recommend her. TOUR GUIDE RESPONSE: Thanks for the review, Jeffery. It was great to share my knowledge with fellow Janeites! I am pleased to hear you enjoyed the tour. TOUR GUIDE RESPONSE: Thank you! It was a pleasure to guide you. Hope you enjoyed the rest of your stay. Sue was personable, knowledgeable, and so fun! We had a wonderful day and gained great perspective on Bath'so place in history. TOUR GUIDE RESPONSE: Thank you for the lovely review and for your great company. I had fun too! I am pleased you also enjoyed cream tea next to Mr Darcy and your Indian treat! Sue was knowledgeable guide and a good sport as she adjusted the tour to our needs. Would love to have her as a guide again. TOUR GUIDE RESPONSE: Thank you for your review, Craig. I enjoyed showing you some of the less visited places in the city as well as the canal area and we adjusted the tour as you had already seen a lot. Hope you enjoyed the tasty Bath specialities. Susan was absolutely fantastic. It was a great overall tour of Bath. She is extremely knowledgable and has a very nice demeanor. I would highly recommend her tour.Bath is beautiful. TOUR GUIDE RESPONSE: Thanks for the lovely comments, Susan. It was great to meet you and I enjoyed your tour very much. Susan was a terrific guide -- very knowledgeable, flexible in her approach, friendly and a great sense of humor. She knew Bath and its history and architecture extremely well and was able to make great recommendations about places to eat and must see spots outside of town and the scope of her tour. We have taken several tours using Tours by Locals, all but one have been really good, but this was probably the best. We highly recommend Susan. TOUR GUIDE RESPONSE: Thank you for your generous praise. It gives me great pleasure to hear that I played a part in helping you to have such a good stay in Bath and I really enjoyed your company. Susan took our family on a tour of Bath last summer and she was fantastic! We saw the highlights...her commentary was excellent...the pace was perfect and she was a pleasure to chat with as well. We would definitely recommend seeing Bath with Susan. Susan was prompt and quite personable. She accommodated our desire for as much information as she had on Jane Austen and how Bath might have been during her time in Bath. Susan's orientation to Bath allowed us to wander with confidence through the city on our own after the tour. TOUR GUIDE RESPONSE: Thank you for your review. I enjoyed showing you the places Jane Austen knew personally and wrote about. Had a wonderful time touring Bath with Sue. She was very knowledgeable about the area. I learned so many things from her that I would not have had I visited on my own. TOUR GUIDE RESPONSE: Thanks for the review. It was a pleasure to guide you round Bath and I am happy that I helped you to enjoy your visit. Susan was warm, knowledgeable, and so informative. Out 11 and 14-year-old grandchildren were with us and she went out of her way to point out places interesting to them. We highly recommend her as she is such a good teacher and yet a lot of fun. This tour was so much fun. Sue was so patient with us and listened to our interests so that she could adjust the tour to things she knew we would like. Her pace was excellent. She allowed us time to take photos but did not dwell on anything too long. She also had photos available to give us a really good visual of the history and educational aspects. She took time during the walk to speak with each member of the group and made everyone feel welcomed. As we were a bit pressed for time, we asked for a shorter tour (just 1 hour) but Sue still managed to fit in an amazing amount. Everyone was totally impressed by her knowledge of Bath and it's history, as well as her professionalism. Thouroughly enjoyed by all. Thanks so much Sue, you made out visit to Bath very special. TOUR GUIDE RESPONSE: I was delighted to be able to help with the Conference and am so pleased everyone enjoyed the tour. Susan did a great job with the tour. Her knowledge of the area was amazing. She was wonderful accommodating our wishes and what we wanted to see and hear about. We look forward to a return trip and another tour with Susan. TOUR GUIDE RESPONSE: Thank you for your review, Paul. It was a pleasure to show you all around bath and I am so pleased that you enjoyed the tour. Susan was especially good with the children!! TOUR GUIDE RESPONSE: I had great fun showing your group round. Please congratulate the children, who were so interested despite the challenges of another language. Perfect choice. We had only a limited time in Bath, and did not wish to walk around on a self-guided tour. Susan is knowledgeable, friendly, and enthusiastic and gave us a great overview of the history, local culture, and architecture of Bath. Highly recommended! TOUR GUIDE RESPONSE: Thank you, Michael.I am so pleased I helped you to make the most of your short time in Bath. I enjoyed the tour myself and chatting over tea was really interesting for me too. I really enjoyed my tour with Sue. She gave me a great overview of the city. Thanks. Tour with Sue was great, She is personable, smart, prepared, and nice. It was like having a tour with an old friend. TOUR GUIDE RESPONSE: Thank you Robert. I enjoyed doing the tour for you and Louana. 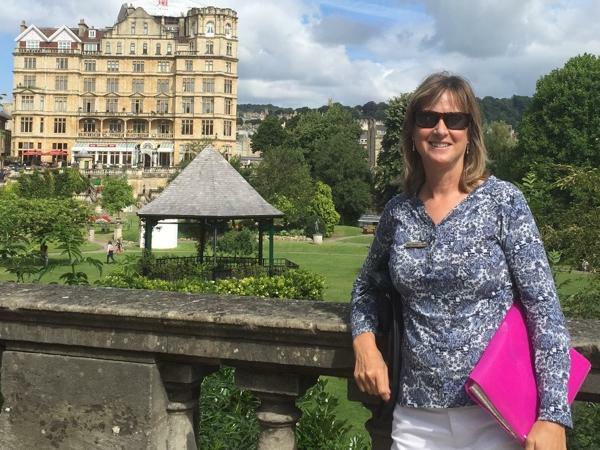 I would highly recommend Susan for a relaxed, informative and pleasant private tour guide in Bath! Not only was she knowledgeable about the city and its history, she was a lot of fun too. Our group of seven thoroughly enjoyed both of our tours and will definitely share her name with family and friends who may be visiting the area. TOUR GUIDE RESPONSE: Thank you so much, Katy. It was good to be able to show different aspects of Bath to your appreciative group on the 2 separate tours. I really enjoyed your company. Susan made our trip truly enjoyable. Her walking tours allowed us to see parts of the city that would definitely been overlooked, if we had not booked the tours. It was so much nicer to have a private tour with our small group, where we could move at our own pace and ask questions. Truly a delightful overnight stay in Bath, thanks to Susan! Susan knowledge of Bath was flawless and well presented. We had teens and adults which she adapted to very well. Highest recommendation. We had a wonderful morning with Susan. Although my wife and myself have been to Bath many many times, Susan told us so much we did not know about. We would highly recommend her. TOUR GUIDE RESPONSE: I'm really pleased you learned something new. I had a lovely morning with you and your guests. Thanks for the review. We were amazed at the professionalism and knowledge of Sue.We were large group of Directors, partners and their children (corporate event) and Sue ensured there was something for everyone, which isn't easy when there is a mixed group. We had three hours to see the main sights and Sue was extremely knowledgeable. She was enthusiastic and nothing was too much trouble. We thoroughly enjoyed the tour and would recommend this site to anyone wishing to explore Bath. TOUR GUIDE RESPONSE: Thanks, Rupi. Tour guiding really is a pleasure, especially when I spend time such a lovely and appreciative group. This tour was booked for a friends 50th Birthday surprise weekend, and Susan was very good at being accomodating around timings etc as we had a lot packed into the weekend! Susan was laid back, working in a stop for drinks and making sure we ended on time and near a taxi rank to get back to our accommodation. She was interesting, making sure that stories were included in the tour as we went around and that we saw areas of Bath which we had not already seen earlier in the day from just being in the city! TOUR GUIDE RESPONSE: Thank you, Leslie. I am so pleased you enjoyed the tour.I enjoyed showing you my city very much. I did Susan's Bath city tour, not the one listed. She asked about my interests and then tailored her tour to them (Jane Austen, architecture)perfectly. Susan is knowledgable, articulate, and very good company. She kept our appointment even though I had been out of e-mail touch and never confirmed time/place with her personally. She lives in Bath and brings that perspective to the tour. I had a wonderful day, an A+ experience. Sue, our guide in Bath was as delightful as Bath itself. Her knowledge of the area ensured that we saw parts of the town that we would never have seen otherwise. She was competent, easy to understand and answered all our questions with confidence. Even though we were one of her first tours I think this added to the experience as she was so proud of her town. Sue will have a long and successful career as a tour guide and we wish her all the best for the future. TOUR GUIDE RESPONSE: Thank you, Len. I really enjoyed showing you all round Bath.